I like to know where my food comes from. 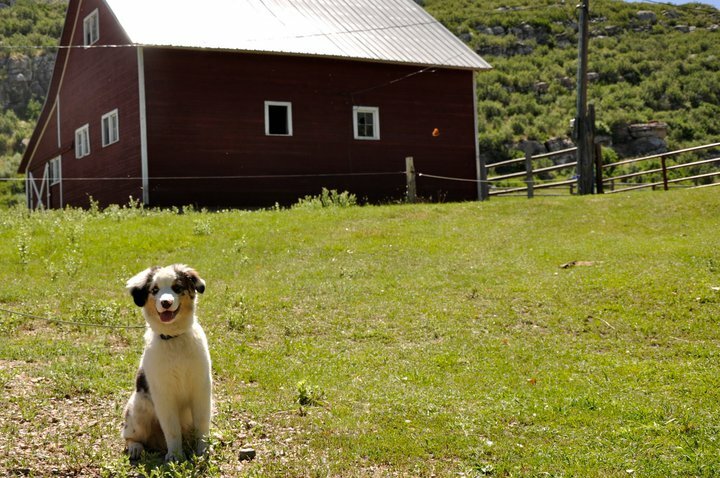 Last summer I visited Bar Double L Ranch in Wyoming where they pasture raise their cows (grass fed and rotating through pastures throughout the year). I know that the cows led a happy life, ate food they were meant to eat, and were humanely treated. This weekend I decided to grill two New York strips I bought from them and wanted to share the recipe. I also took a roadtrip down the Pacific Coast Highway ending in Napa Valley last summer. I’d definitely recommend it, especially if you have a fun car like a Subaru WRX. After a couple of recommendations we ended up at Lava Vine Winery. 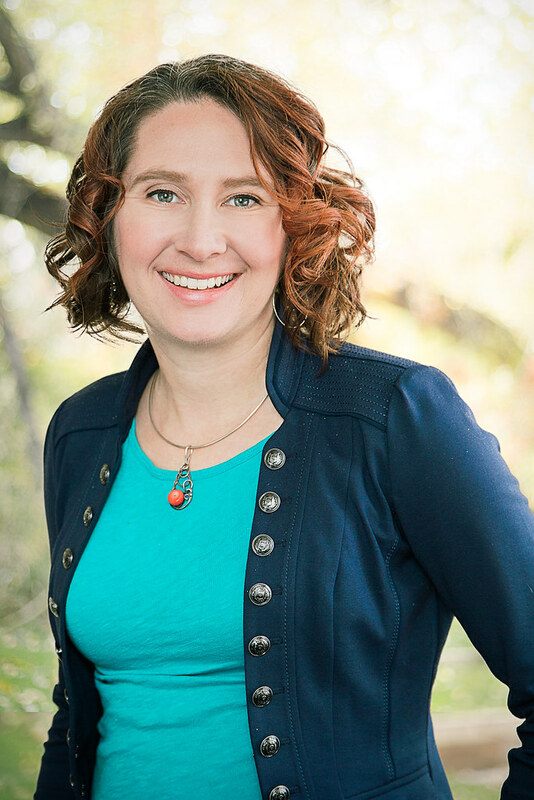 We loved the wine and the owners so much we decided to join their wine club. They paired food with our wine tastings, loved Desi, and were a lot of fun to visit with (definitely not wine snooty). 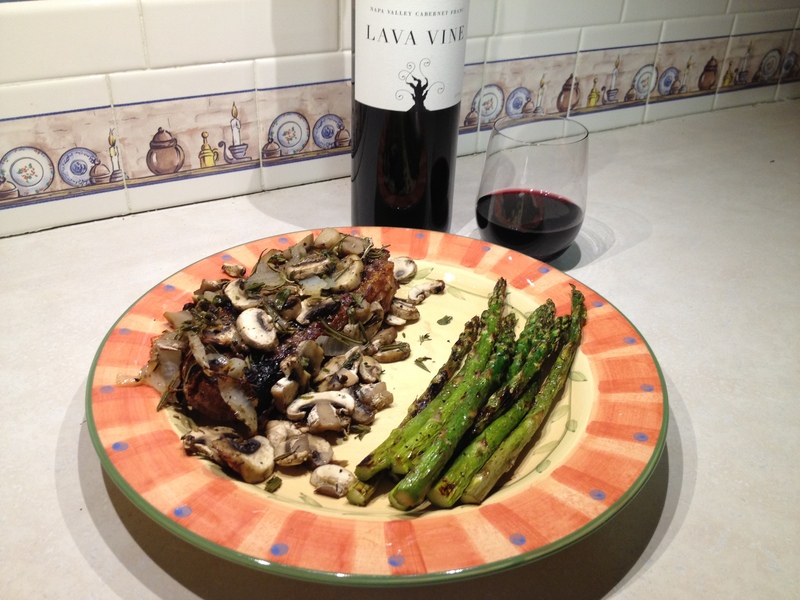 We paired our steaks with a Cabernet Franc we recently received from Lava Vine. Drizzle side one of the steak with olive oil. Sprinkle steak with salt and freshly ground black pepper. Chop or cut 3 sprigs of oregano, 1 sprig of rosemary, and 2 sprigs of thyme and sprinkle on side one of the steak. Press herbs and seasoning into steak. Flip steak to side two and repeat 1-3. Remove from fridge about 15 minutes before cooking to let it come to room temperature. Cut onion into thin 1/2 moons and slice mushrooms. Smash and peel the garlic. Divide evenly between two pieces of foil. 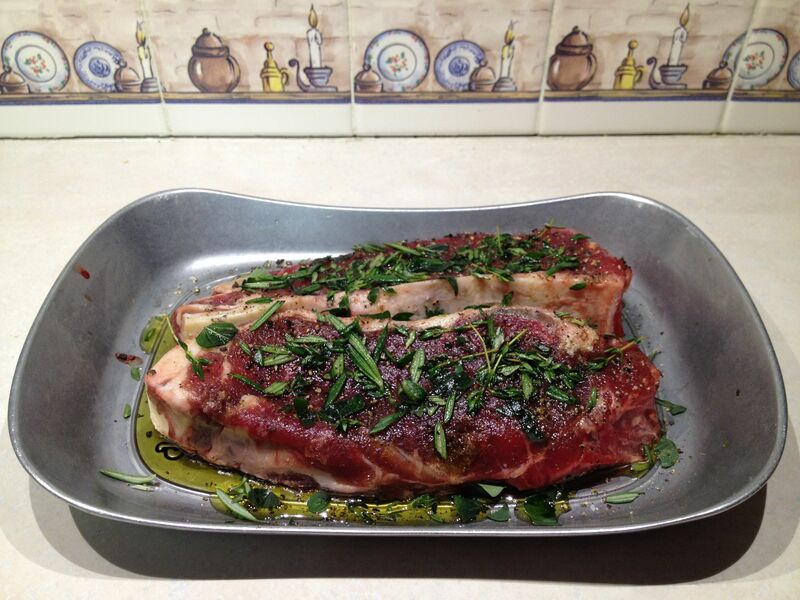 For each piece of foil slice and add 3 sprigs of oregano, 1 sprig of rosemary and 2 sprigs of thyme. Add salt and pepper to each foil. Add 3-4 pats of butter to each foil. 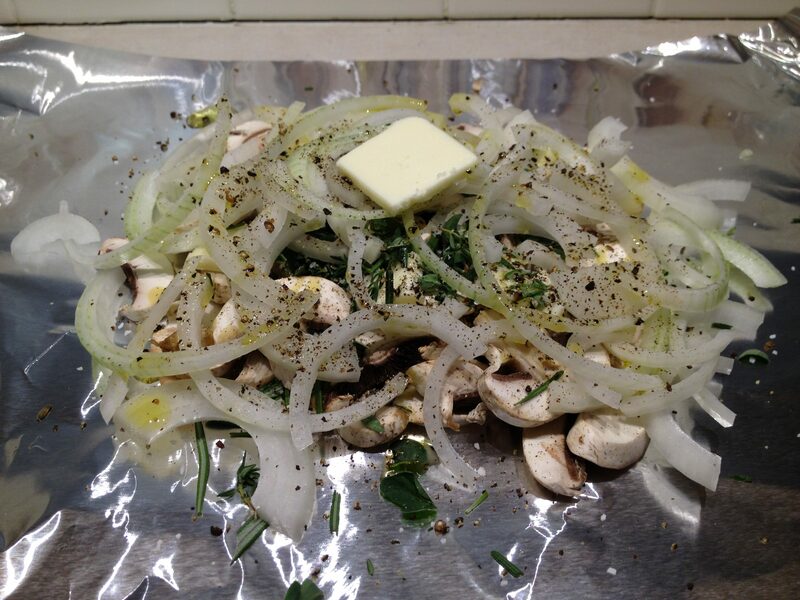 Seal onions and mushrooms in foil to make small foil packets. Add to the grill about 20 minutes before you plan to cook the steaks (about the same time when you remove the steaks from your fridge). Continue to grill while steaks are cooking and remove when steaks are done. 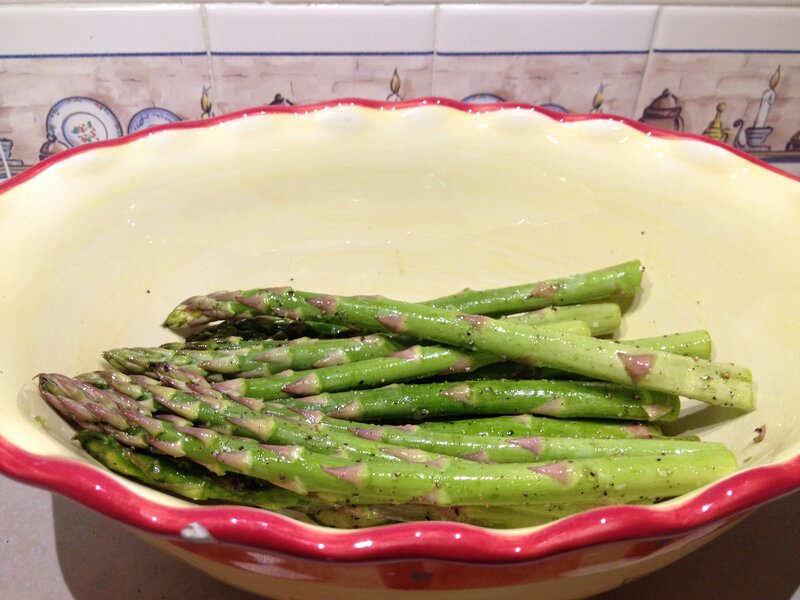 Chop off the ends of the asparagus. Drizzle with olive oil, salt and pepper. Toss to evenly distribute olive oil and seasonings. Place on grill when you start cooking the steaks (I use a grill pan so that they don’t fall between the cracks on my grill). Rotate asparagus when you flip your steaks. Remove when steaks are done.